Bradford-on-Avon in West Wiltshire, 8 miles from the Georgian City of Bath at the south western end of the Cotswolds and is of course a main tourist holiday destination.There are a number of places to stay offering accommodation centrally and others located on the outskirts which are ideal for combining touring Bath, Chippenham and Trowbridge. The BEST WESTERN Leigh Park Country House Hotel & Vineyard is a stone's throw from Bath, set in the Saxon town of Bradford-on-Avon. This wonderful Grade II listed building is a Georgian country house retreat, set in 5 acres of landscaped gardens. As such, you'll have more than enough room for relaxation during your stay. Queen Elizabeth I is believed to have stayed in the original house here, so as far as past guests are concerned you'll be in the very best of company! In addition to Bath, a number of other attractions lie within easy reach of this elegant hotel. 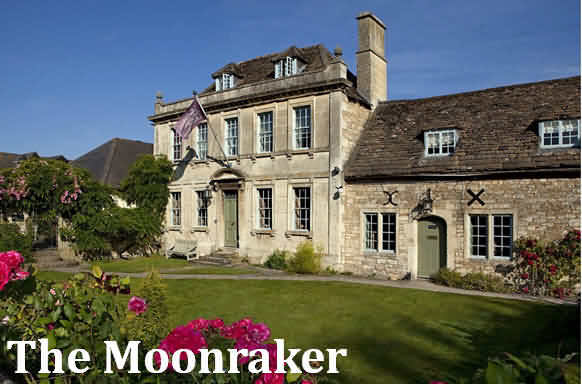 The Moonraker hotel, a grade 2 listed 21 bedrooms Manor house situated on the outskirts of Bradford on Avon/ Trowbridge and a 15 minute drive from the Bath Spa. Mentioned in the Domesday book as being part of the Abbess of Glastonbury's estate, the Manor house was originally build in Queen Ann Style before being upgraded in the 17th century to Bath stone. Purchased by Tudor & Lucy Hopkins in July 2013 the hotel has undergone a full refurbishment including transforming the restaurant into a relaxed informal dining space. Head Chef Matthew Briddon (River cafe, Paul Heathcotes) joined the team in September 2013 and has created menus around the hotels kitchen garden and onsite smokery. Nine bee hives provide the hotel honey and rare breed pigs live on the grounds. Kathy Lette (writer and author) stayed at The Old Manor and wrote an article for the Express where she said: 'The bedrooms, with their four poster beds and wide wooden roof beams, are so Jane Austen-esque I kept expecting Mr Darcy to get down on bended knee' The Moonraker oozes old world charm and is a relaxed cotsworld escape with some of the UK's top attractions on its doorstep. 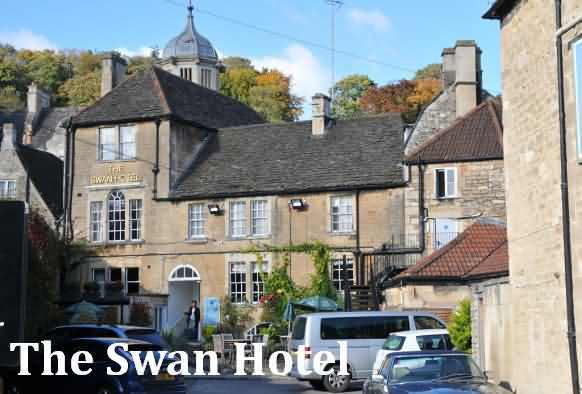 Adjacent to the River Avon, The Swan is an enchanting 15th-century coaching inn, in the heart of historic Bradford on Avon. Situated 7 miles from Bath, it also offers easy access to Longleat Safari Park, 12 miles away. The individually decorated rooms feature an en suite bathroom, a flat-screen TV, and free Wi-Fi. Guests can enjoy breakfast and traditional British food, freshly made using quality ingredients from local suppliers. A restaurant, The Coach House and The Cellar Bar offer varied menus including vegetarian options and pub classics. Situated next to the medieval bridge crossing the River Avon, The Swan is 150 yards from St Laurence's Church, which dates back to 10th century. The charming town of Lacock, which appeared in BBC productions and Harry Potter’s films, is only 9 miles away. In a peaceful countryside location, only 6.8 miles from Bath, these beautifully converted farm buildings now house en suite rooms with their own separate entrance. 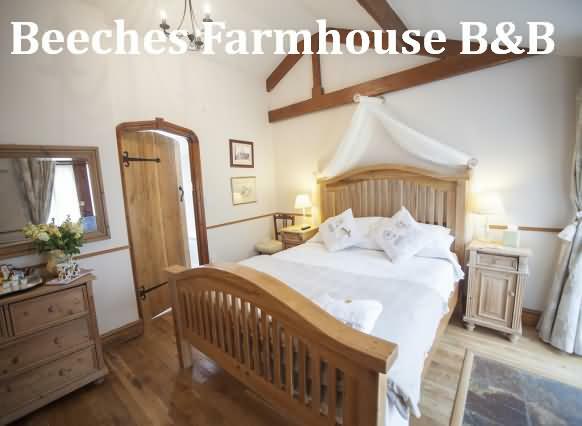 In Bradford on Avon, on the edge of an area of Outstanding Natural Beauty, the Beeches Farmhouse Bed and Breakfast offers luxurious accommodation in delightful 18th-century farmhouses, built from local limestone. There are 2 double rooms, 2 twin/double rooms and a family room, with all but 1 in detached converted farm buildings. Each has its own front door key and patio area, giving you the independence to come and go as you please. All rooms have full en suite facilities, including baths and showers. Sympathetically restored to their former glory, the rooms are decorated to a very high standard, with original exposed beams, stripped wooden floors and country pine furnishings. All rooms have colour TVs, radio alarms, tea/coffee making facilities, mineral water, fresh fruit and flowers. For room bookings, breakfast is taken in the conservatory in the main farmhouse. Cottages are self-catering and do not included breakfast. 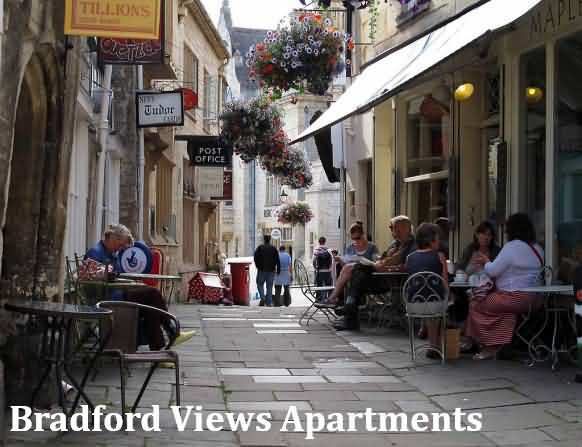 Located in the historic town of Bradford-on-Avon, this Grade-II listed building is set along the historic pedestrian walkway ‘The Shambles’. Featuring contemporary décor, Bradford Views apartments offer free WiFi and interesting views over the rooftops of the town. 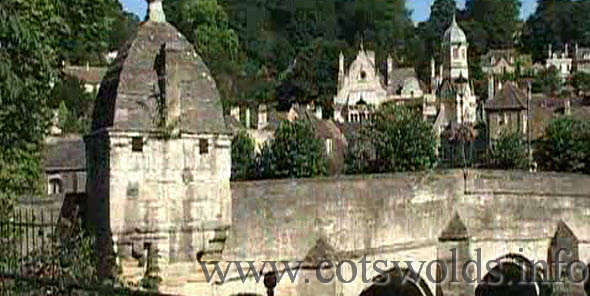 The UNESCO World Heritage City of Bath is a 20-minute drive or a 10 minute train journey from the apartments. Apartment 2 is set on the first floor and has 2 double bedrooms with town views. Apartment 3 is set on the second-floor and offers all round town views and has a large double bedroom and a smaller bedroom with a single bed and a further pull-out single bed if required. The spacious open-plan living areas at the Bradford Views apartments each have 2 sofas with a flat-screen TV and DVD. The modern kitchens are well equipped and the bathrooms have a separate shower and bath. Bradford Views is just a short walk from a variety of shops, boutiques, supermarkets and restaurants.The River Avon and canal can be found close by. Bradford-on-Avon Railway Station is a 5-minute walk away and connects you to Bath in 10 minutes and London in 2 hours. Longleat House and Safari park is only a 25-minute drive away and Farleigh Hungerford Castle is 2 miles away. Free 24-hour parking is available.